Recently I posted about the excellent monster erasers that are being sold by a school supply retailer called Geddes, and while I was on their website grabbing those I discovered some other goodies of interest to mini figure and monster toy collectors. First is a set that's simply called "Alien Robot erasers." The name's a bit misleading because while they might pass as aliens, there's really nothing robotic about them. They look more like anthropomorphic animal warriors. In fact, according to posts in a thread on LittleRubberGuys.com, they seem to be modeled after characters in the Gormiti series, specifically lords of Earth, Air and Water. Like the monsters, they're made of a soft-yet-dense rubber similar to that of pencil erasers. They're each about 2" tall and come in three solid colors: blue, yellow and lime green. There are four different sculpts in the set. My favorite is the aquatic-looking guy with an elephant head. Another one looks to be some sort of bird creature with horns, and as for the other two, your guess is as good as mine. 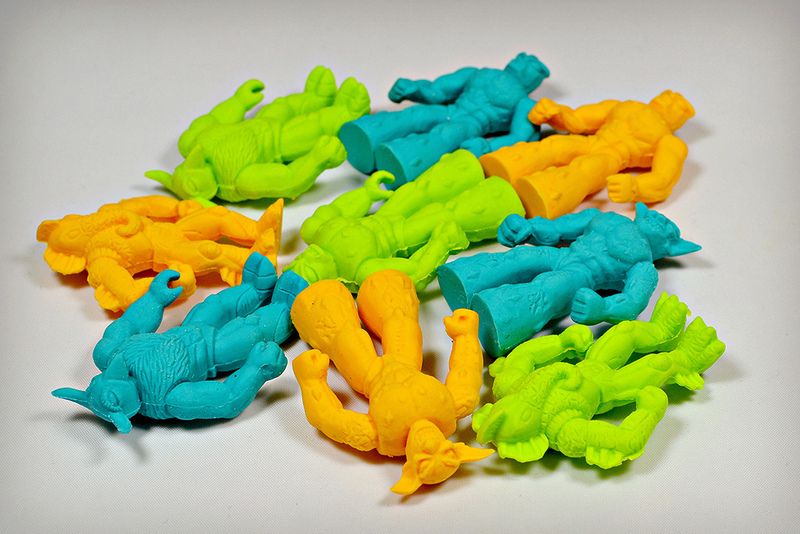 At the time of writing this, you can pick up a bag of 24 Alien Robot erasers on the Geddes website for just under $9. Another cool set with keshi-lover appeal that's currently being sold by Geddes is one that's simply called "Martian erasers." Pictured above, this set consists of four different extraterrestrial beings that are a bit over 2" tall and also made of rubbery eraser material. They come in four different colors: light blue, dark blue, lime green and yellow-orange. The sculpts on these are pretty nice, featuring different types of martians including a reptilian one, a classic kind of "little green man" alien, and one in a space suit that looks like it came straight out of an old sci-fi B movie. The only one that is a bit of a letdown is the cutesy, goofy looking one with antenna. He's just not as cool as the others and doesn't look like he belongs to the same set. You can currently pick up a bag of 24 at the Geddes site for about $5.50. 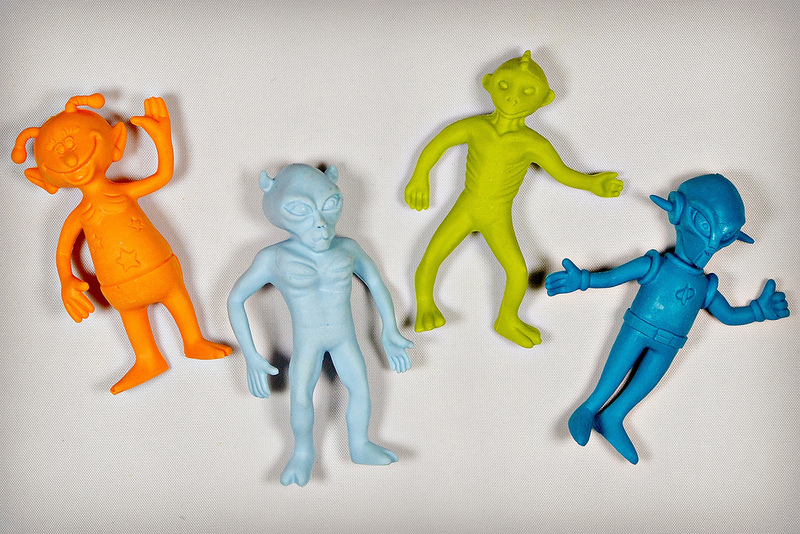 All in all, these Alien Robot and Martian erasers are pretty great and remind me of the good ol' days of Diener space-themed erasers and strange little figures in vending machines. What do you think of them? 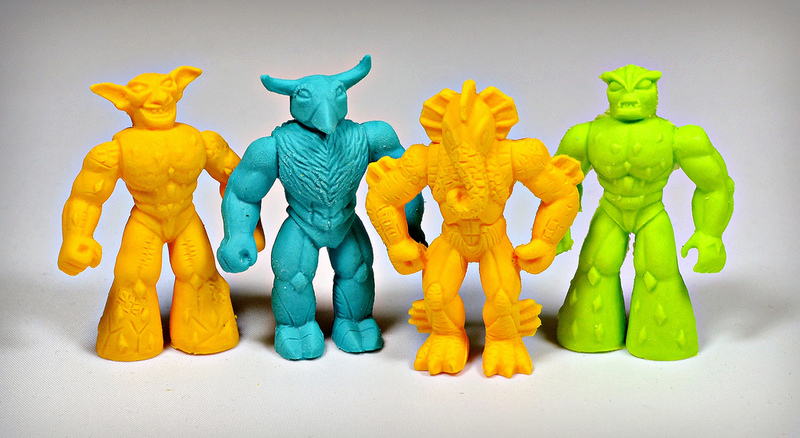 If you picked up the monster erasers, did you go for any of these as well? The orange Alien Robot figure with big pointy ears looks exactly like a goblin from the MMORPG World of Warcraft! (http://www.wowwiki.com/Goblin) Not sure what the lime green guys is supposed to be. Somehow, he looks familiar. Can't quite put my finger on it. These guys are great, I'd love to have some to stow away in my desk draw. The B movie martian and the baby blue moon man are my favs. Among the Alien "Robots" the WoW Goblin is my favorite. These are pretty cool, I picked up some when I got the eraser monsters. I agree, the elephish dude is the better of the 'robots'. The martians are not bad either, except for the goofy one that doesnt fit. Whats up witht that guy? He has stars on his body, and i cant work out if he has any pants or not.. The green guy is my favourite from this lot, he reminds me of a kappa. Haha yeah, goofy Martian is kind of like the village idiot of the Martian erasers. Poor goofy Martian. Had no idea these sculpts were being sold elsewhere. I wonder how different the material is. Thanks for sharing!